If you are interested in understanding the mind of a professional, veteran computer RPG developer, you should head over to RPG Codex and check out this fantastic interview with Josh Sawyer. It’s lengthy, and well worth it if you are at all interested in the nuts and bolts that go into making a commercial-quality computer RPG. 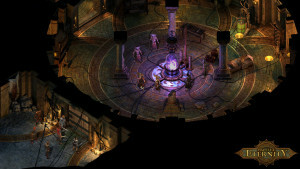 Most of the interview is in the context of Pillars of Eternity, but that often just provides context and concrete examples for discussing more general principles of game design. Do you think it’s realistic you can do more, like have a fight be skippable by a certain class? Yeah, I think that’s possible. Again, I think it’s really about trying to encourage the designers to look for opportunities to use that stuff. And it’s actually something we’ve talked about, like when you’ve built a quest, “What character builds are you trying to reward and make feel cool in this quest?” You’re not going to feel the coolest in every single quest, and if you did, that doesn’t even make any sense. You can say this is a quest, for example, where if you use stealth there’s a very well-defined path to get through it, so if you have a stealth oriented character you can feel cool doing it. If you play a Wizard, you’re going to get a chance to do arcane stuff and the quest is going to respond to you in a certain way and you’ll feel cool doing it. So I think for us really, it’s less about the will to do it and more about encouraging the designers to really sort of emphasize. Like, we don’t want to have something where it feels like if you’re not this class you can’t do it at all. But if you’re this class, it can be a lot easier or it’s done in a different way and feels really nice. Looks like the link didn’t make it in! D’oh! I remember pasting that in, but something didn’t work. Thanks! Wow, that really was lengthy! But I enjoyed how they got into a lot of the details and reasons for their decisions.